Following the successful participation at Pollutec 2014, ETV will once again be present at this year’s exhibition, taking place from 29 November to 2 December in Lyon, France. A European Commission representative of the ETV pilot scheme together with the French Verification Body RESCOLL will attend the event to raise awareness of the EU-ETV scheme. 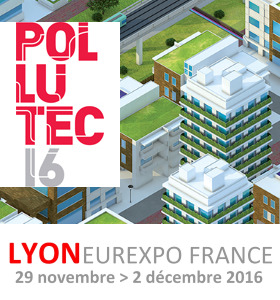 Pollutec 2016 is the 27th edition of the international exhibition of environmental equipment technologies and services. As the leading general trade show on the environment, Pollutec covers all sectors of the environment and brings in nearly 11,000 visitors from a hundred different countries. Over the four days of the event, the European Commission representative will introduce ETV to participants at the Green Days B2B meetings, organised by the Enterprise Europe Network Auvergne Rhône-Alpes. We will present the scheme during a conference at the Sustainable Industry Forum on 1st december.